Has anyone noticed that if you stare at one specific thing, something that's a little more interesting than the rest of a dark room (a little red light, for example), that if you just keep staring the room around you gets darker? There's an enormous urge to readjust your focus, but it breaks the spell if you do. I spent last night trying to ride it out and see if I fell asleep, but I couldn't. However, during my best tries, it seemed as though the entire room was pitch black, and all i could see was my little red light. It felt like the "vibrations" after a good half hour of WILD tries, but after only a couple seconds. My question is if anyone has kept staring at it and fallen asleep because of it. I don't think many people can sleep with their eyes open. Ohhhh. The fatal flaw. Well, maybe he means just naturally drifted off to sleep whilst staring at it....like almost not even realizing you closed your eyes. haha. yeah, i had that problem as I was trying it. I was just wondering if anyone else had actually gone through and gone somewhere with it. Anyway, your body would probably close your eyes for you once you started dreaming. Yeah, I know exactly what you're talking about, by saying that the rest of the room darkens as you stare at one bright-ish object in the room. Your eyes want to twitch or shake or move, it seems like they'll do anything to re-focus. I don't know why it looks like everything around it is getting darker, but it gets to the point where a dim room suddenly appears pitch-black until you move your eyes. It's a weird feeling...but it probably requires too much effort to fall asleep and lucid dream with, though I'm not sure, and I've never tried. I could do this a lot when I was younger, but my vision always turned white. If I were to do it nowadays, it would turn black. Also, you should probably rename this thread since it's not a true induction method and it might confuse noobs. When the room became dark it just meant that you about to go into trance...just like the magician hypnotize people by having them concentrate on a wristwatch. Anyway, what you could do when you get to this point is to close your eye. You should see the after image of the red light in your mind eyes. Continue to concentrate on this image and see how long you can keep it there. When you loose it open your eye again and look at the light. keep doing this and eventually at some point went you close your physical eye to look at the inner image...there will be a "click" and you will switch over to the dream world. haha, when I was a kid I heard that some people could fall asleep with their eyes open. So I would try to do this in church so my Dad wouldn't get pissed at me cus it would look like I was still paying attention.... I don't think I ever actually managed to do it, but everything would become black at times. Actually I remember when I first joined (march 08) there were threads like this pertaining to WILD floating around. The ones on reverse blinking and etc., they had concepts like this in them. May want to search around. It's nothing about your age. If you try it in a bright room, it gets white, and if you try it in a dark room, it gets black. I think the cutoff point for each is whether you're using night vision or color vision. Oh yeah, how do you rename threads? That remids me of a test a group of scientist did along time ago. They took someone and made it so they numbed there eye muscels so they couldent look away and after an hour of looking at the same exact thing they eventualy couldent see any thing. 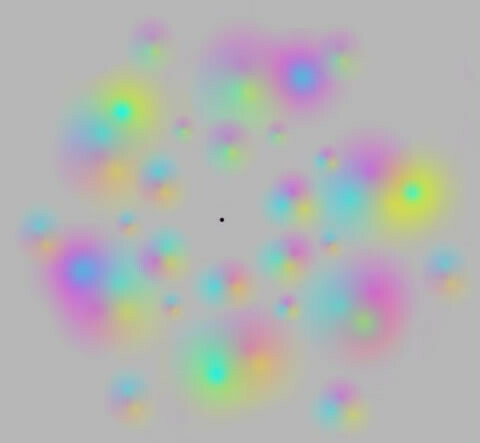 heres an exampe of what your eyes are doing just star at the picture lond enough and the colors will go away. Holy crap that color thing is AMAZING! I love DEILD! SP is pwnage!